In England, it rains mostly. Sometimes, we have fog. Just for a treat, we may get rain and fog. Predominantly, it is cold, and on the odd occasion it snows. On a really bad day, we get it all at once. It doesn’t make sense for me to be a chuck fan, a chuck addict, a chuck nut. What possible use could there be for chucks in this climate? Besides, these bouncy, stylish, roguish shoes are so un-English. As a nation, we have given the world many great things — the Industrial Revolution, Shakespeare, sandwiches, but no really great shoes. You Yanks on the other hand, well I’ve got to hand it to you, you’ve come up with some great ideas (daytime TV isn’t one of them) and those chucks are one of the best! When I was really young I had sneakers, or plimsolls as we called them, for gym class. Little black canvas and rubber-soled slip-ons with stretchy elastic where the laces normally are, like ballet shoes. I used to wear them after school sometimes, for playing, but only because I had nothing else. They used to get a fair battering (as all young boys’ shoes do) and so they didn’t last long. One thing I do recall: Mum would buy me a new pair every term. I came to look forward to my new plimsolls: for that super-sensual first try-on back at home; for the close fit of canvas, and sure grip of rubber; but also for that smell. The seed was sown there for me, and although the “plimsoll” thing is a peculiarly English phenomenon, it’s still a familiar story — how many of you chuck fans out there also really love that unique canvas and rubber smell? Anyhow, that’s how it started. As a young teenager, I was dimly aware of Chuck Taylors only through seeing them in films like Grease and musicals like West Side Story: lots of sparky, confident young men (who were supposed to be my age but seemed much older) doing just about everything in chucks: running, playing basketball, and hanging out, driving their own cars, chasing girls, enjoying sunshine and basking in the promise of a golden future despite not going to school. That was where I wanted to be, and I guess I began to associate chucks with that unattainable freedom and energy. With University looming, I already knew which shoes I needed — chucks! At the time, the problem was that I still didn’t own any. I was still in the plimsoll zone. I used to browse through Mum’s home shopping catalogues and see the new Adidas, Nike and Reebok lines. I wanted these too, but it was those rare pages with a chucks-wearer that really caught my eye. My friends and I were all really getting into sneakers by now — PE classes gave you a chance to check out what everyone else (but not me!) was wearing: Puma, Adidas, and the occasional Nike. Trips to London with friends always included as many detours into sports shops as possible, where I got my hands (but not yet feet) on a chuck for the first time. 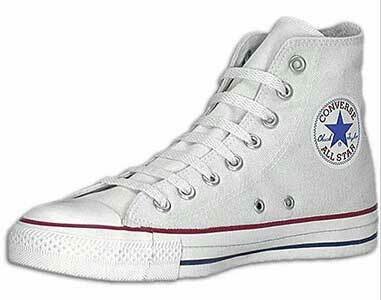 I remember being surprised that chucks had brown soles — with grips in that incredible diamond criss-cross pattern. I’d never seen them from underneath before! By now, I was getting desperate for my own pair. I couldn’t afford them on my own, so I asked my parents to buy them for me. Chucks have always been much more expensive in the UK: £30 (currently $45 or so) is the norm, though that’s still cheap compared to Nike prices. Yeah, there were plenty of chuck clones on the market, but they just wouldn’t do. To this day I maintain a healthy contempt for clone wearers — just who do they think they are kidding? For every chuck wearer, that first pair are extra special. I was with my Dad in Lillywhites in Piccadilly Circus, London, where they had a wall of them in every imaginable colour. I remember standing in front of them, as I had done many times before, soaking up this vision of All Star Heaven. This time the anticipation was even greater because I knew I was about to try some on! Flushed with delight, and trembling with joy, I took my time, even though I knew (had known for years!) which ones it would be. I pointed out the white high-tops: “These, please: size 7,” sat down to unlace my shoes, and waited for my first pair of Converse All Stars to be brought to me. “Wow! So they feel as good as they look!” I thought. As I laced them up, I felt them close perfectly around my foot. I could have floated away on them. They were already going to be mine, I knew, so I tried the other on and took my first steps in All Stars, over to the mirror where I stood and admired myself and my glowing new chucks: the pristine rubber toe cap, the neat red line at the top of the rubber, the legendary ankle patch, the creamy-white new canvas. Then, a few paces, up and down. Walking had never felt so good! I couldn’t wait to get them home and try them on, really make them mine. The shop assistant had twisted the laces, a terrible crime which I soon rectified. That night, I left them out instead of putting them away in my closet, and they seemed to glow in the darkness. I could even make out the blue star on the side! Of course, in rainy England of all places, white canvas could never stay perfect for long. I am torn between the desire to get my wonderful chucks on my feet and the need to preserve them in the best possible condition. When a clumsy friend trod on my foot, leaving a nasty black smear down one side, I was livid. I tried everything to get that horrid smudge off my lovely white boot, but it was no good. For me this was a crime equivalent to drawing a moustache on the Mona Lisa. A few years later, at University, I was suddenly not the only chuck wearer. They were everywhere! Impractical as ever in our climate, and totally useless for keeping your feet warm on a really cold day, they are still a very cheap way of looking very cool, and so cheerfully indestructible. Some people wore their chucks right down to the last stitch, whilst I always struggled (and still do) to keep my chucks as clean as possible. The first thing I did on my return after each vacation was head into town to hunt down some new chucks, preferably at a bargain price. Ah, the joy of the hunt, and the reward of finding a pair of chucks that are just right - there’s nothing to beat it! Since then, I haven’t looked back. I’ve gone through about 15 pairs in the 10 years since my first pair. Many, including my beloved originals, I threw away — which I now regret. The first few pairs were all white high-tops, then I got a pair of blue high-tops. A few years later, on a trip to New York, I also got my first pair of black high-tops, to add to a collection which has seen other wonderful additions such as optical white high-tops (perfect! ), and black monochrome (which I loved — they don’t seem to be available in the UK these days). Only recently have I discovered low-tops but such is the endless variety of Mr. Taylor’s wondrous shoes. The trainer/sneaker market is constantly renewing itself. In this throwaway world of short concentration spans and instant obsolescence, that is one of the things that appeals. Having bought one pair, we then seek out the next. Why then are chucks still leaping off the shelves? For me, it’s because we all recognise a classic when we see one. Chucks are for everybody. It amazes me to think that my grandparents (had they gone to the USA) could have bought a pair fundamentally identical to the pair of black high-tops on my feet right now. It will be great to see my grandchildren wearing them too in years to come. Chucks are one true classic we can all afford: they are the classic car of sneakers, a Rolls Royce for the price of a second-hand Nissan, and they aren’t made in dark Asian sweatshops. For me, and I know I am not alone, they are the footwear of choice — even if I can’t go out in them because of the rain. They are perfect for every occasion, and that includes putting them on to stay in!